ST. PIERRE-JOLYS, Manitoba, Canada, January 27, 2014 (ENS) – A TransCanada natural gas pipeline ruptured and exploded early Saturday morning in an isolated area near the town of Otterburne, 25 kilometers (15 miles) south of Winnipeg. 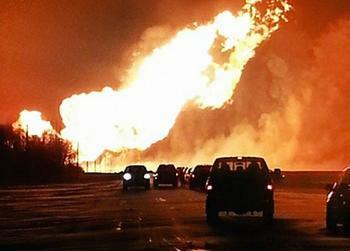 The pre-dawn pipeline break and resulting explosion sent a massive fireball into the night sky. The incident on the sweet natural gas pipeline owned and operated by Calgary-based TransCanada Pipeline Inc. was reported to the National Energy Board at 3 am local time Saturday. Local residents were not harmed, but as a precaution one home near the area was evacuated. The incident triggered emergency measures that included isolating the pipeline, shutting it down and depressurizing it to contain the fire and avoid further damage. The blaze was extinguished by Saturday afternoon. The National Energy Board of Canada deployed an Emergency Response Team that is onsite to monitor and assess the company’s immediate response. Representatives from TransCanada Pipeline are on the ground securing and assessing the incident site. The local fire department and Hydro Manitoba personnel are also there to lend support. TransCanada is working to confirm a restoration time for restarting the flow of natural gas into the Manitoba Hydro distribution system. Speaking to reporters this afternoon, senior company spokesman Karl Johannson said officials do not know what caused the fire and explosion. “It’s going to take time before we can figure out the cause of this fire, and it’s going to take some evaluation and analysis before we can give you an answer on what exactly has occurred,” he said. Meanwhile, about 4,000 people in several southern Manitoba municipalities have been told that the pipeline explosion means they will be without natural gas service for several days as temperatures hover close to -20 degrees Celsius (-4 degrees Fahrenheit). The current temperature in Niverville is -24 degrees Celsius (-11.2 Fahrenheit). TransCanada said it expects natural gas service to be restored later today to some of the affected Manitoba homes. Service to the rest of the affected buildings is expected to be restored by midday Tuesday. “It’s a temporary bypass until we can get the full line repair done,” said TransCanada spokesman Shawn Howard. The cause of the cause of the explosion may be known for weeks, or even months, he told reporters today. During this gas outage, Manitoba Hydro is asking residents to turn down thermostats and minimize the use of electric heaters. In an emergency, the Board works with federal, provincial and local partners to coordinate the regulatory response. The NEB’s priority in any emergency is to make sure that people are safe and the environment is protected. The NEB will be working with the Transportation Safety Board in assessing the cause of the incident. The Board, an independent federal regulator, holds regulated companies responsible and accountable for responding in a manner that protects the public, property and the environment, including clean-up and site remediation. The Board’s long-term goal with any incident is the full restoration and re-vegetation of the site including any potential effects on sub-surface groundwater. “We do not relax our expectations of a company, or our response, regardless of the size of the incident,” the Board said in a statement. This latest pipeline rupture puts TransCanada’s safety record in the spotlight. The company is intent on persuading U.S. President Barack Obama that its proposed Keystone XL pipeline to carry diluted bitumen from the Alberta tar sands across the Canada-U.S. border to hook up with the newly opened Oklahoma-Texas pipeline will be safe and in the U.S. national interest. Environmentalists have fought the expansion plans, citing concerns about oil spills along the line in the United States. President George W. Bush approved TransCanada’s first pipeline into the United States, Keystone I, in 2007. This pipeline leaked 14 times in the first 12 months of operation. The worst spill was over 21,000 gallons of tar sands oil and toxic chemicals that occurred in North Dakota.